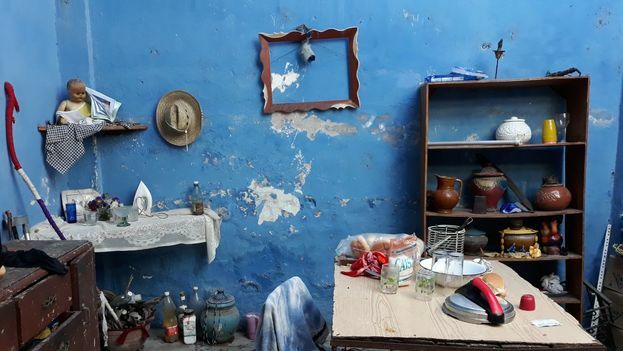 14ymedio, Luz Escobar, Havana, January 31, 2019 — Through the wide esplanade of the Church of Jesus of the Mountain the residents of Mango street go to look for food. There was Fefa, who went out this Tuesday at noon along with two friends with plates in hand. They spoke under the sun, which was burning strongly, shaking the plates from side to side, the food intact without spilling. “Are you a journalist? Good, listen to this. Nobody has come here, half of my house completely fell down, I’m sleeping in the elements, without mattresses. Now I came to the church so they could give me food because I don’t even have anything to give to my daughter. It’s a lack of respect that nobody from the government has come here, and all of us are mothers,” she says while walking down the hill that leads to her street and making a gesture with her hand for the journalist to follow her. A stone fell from the roof and broke Fefa’s washing machine. 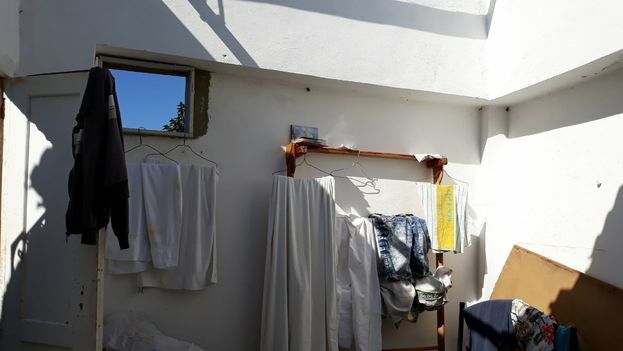 She wants to show the rest of her house but from the back a voice yells: “Wait, I’m bathing, I’m bathing.” In the last room of the house, with walls but without a roof, a woman who takes water out of a can with a jar, sticks her head out several times to make sure nobody comes back and sees her naked. 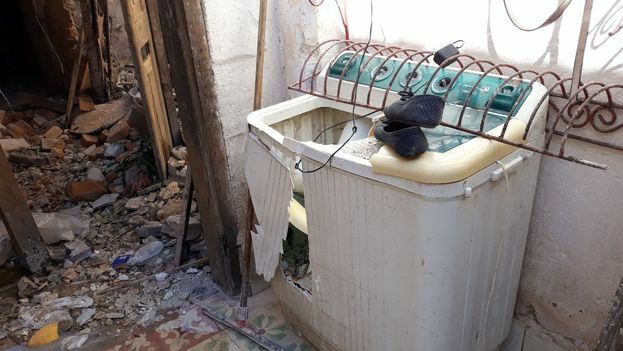 Fefa keeps showing the damage to her house, like the refrigerator, which was broken in two. “They asks us for money for the federation [of Cuban women] and the CDR [Committee for the Defense of the Revolution], but to do their duty by the people no. To top it off, when the help arrives they sell it to you, no, that cannot be,” she complains. 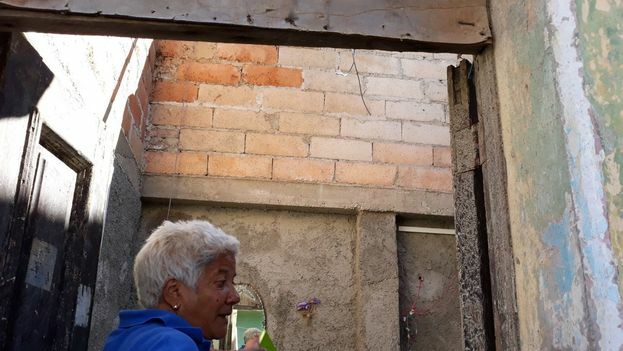 On that same block lives Emilia Delgado Mango, an older woman, who lives with her mother and still hadn’t finished building their house “by our own effort” when the tornado came. “The first night, after that day, we slept in the kitchen, which is the only one that has a roof, seated on a big easy chair. The only thing I’ve eaten is bread with cold cuts that they brought, nothing more. They didn’t say anything about going to look for lunch, and I can’t go to Reyes park because I don’t have money and I can’t leave the house alone. 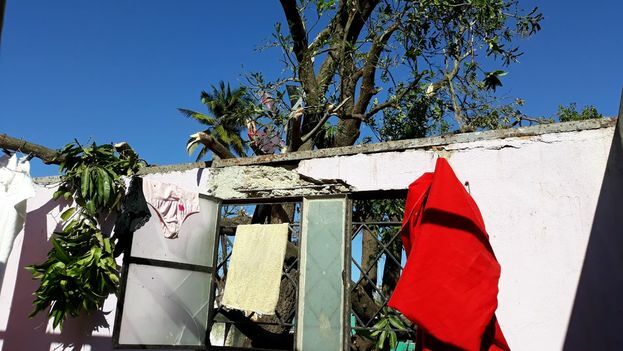 Hurricanes have names, Irma, Flora…but tornados don’t,” she reflects as she shows the easy chairs that she has managed to salvage and the window she grabbed before it went flying. In Reyes park there is a point of sale for food where for 11 CUP (Cuban pesos, roughly 45¢ US) you can get a piece of chicken, rice, and yam, but Emilia Delgado doesn’t have a peso and has only eaten a piece of bread in 48 hours. They also sell cookies for 25 pesos and pork. Ada Morejón took a Librium and was in bed all afternoon until she heard that there was someone to talk to about what was happening.